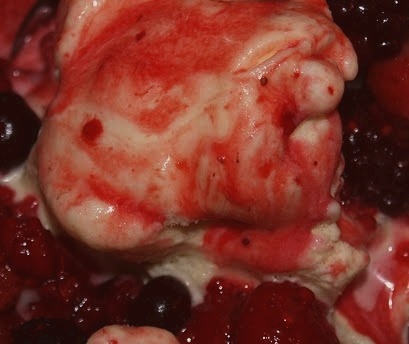 Strawberry Ice Cream made with ripe strawberries, sugar, lemon juice and ice cream mix. Take two pints of fresh, ripe strawberries, and prepare them by cleaning and topping them and cutting them into medium sized pieces. Then add in 1/2 cup of sugar and the juice of 1/2 lemon. Add the juice from the strawberry preparation to the mix along with 10 drops of red food coloring and place the remaining strawberries in the freezer compartment of your refrigerator while you freeze the mix according to the manufacturer’s directions. When the ice cream is almost frozen, add in the strawberries and finish freezing.